I would like to take this time to promote a business and Etsy shop owner very dear to me. She is the own who bestowed me with all genes creative, my mother! 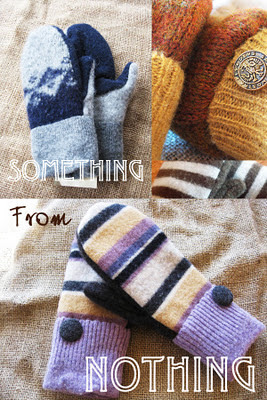 She is an artisan working from home to create warm, woolly mittens out of recycled felted sweaters! This is a fantastic way to reuse discarded clothing to produce something functional and cute (especially for those frigid prairie winters!) I have to say, I've received a new pair every winter and they kept my hands toasty all 6 months of winter long- they are the most comfortable pair you will ever own! Take it from a prairie girl who knows (and loves her mom). Visit the shop here and support a hard-working mother and, of course, the environment. You are so cute!! !And how cute is it that your mom is an Etsy Shop owner??? My mom isn't crafty at all!!! LOL I am heading to check out your mom right now...great post Pretty Lady! I own 2 pairs, and would recommend them to anyone!